The Blue-headed Parrot, along with many other South American species of parrot, regularly visits clay banks along rivers to ingest the mineral to neutralize toxins the birds take in with the seeds they eat. P.m. menstruus: Both adults in general green; blue head and neck, with faint red band on throat; dull black ear coverts; red undertail coverts tipped with blue/green; olive/brown lesser wing coverts; green median wing coverts, with wide olive/brown edging; green tail with red at base. Bill dark grey with red at base. Eye ring pale grey, eye dark brown. P.m. reichenowi: Both adults blue of head, neck and throat darker; green lower underparts washed with blue; red undertail coverts tipped with blue. P.m. rubrigularis: Both adults as in menstruus, but blue of head and neck duller; more red on throat; darker green upperparts. P.m. menstruus: Pale green head, throat and breast; yellow/green undertail coverts, with varying red markings. Bill pale grey with orange/yellow at base. Calls are high-pitched screeches and screaming notes; also some notes harsh and shrill. Soares-Filho et al. 2006, Bird et al. 2011. Aviary or suspended enclosure, minimum length 2-3m (6.5-9.8 ft). Fruits such as: apple, pear, orange, banana, pomegranate, cactus fruits, kiwi, forming about 30 percent of the diet; vegetables such as: carrot, celery, green beans and peas in the pod; fresh corn; green leaves such as: Swiss chard, lettuce, kale, dandelion, sowthistle, chickweed; spray millet; small seed mix such as: millet, canary, and smaller amounts of buckwheat, oats, safflower and a little hemp; soaked and sprouted sunflower; cooked beans and pulses and boiled maize; complete pellet. Are avid chewers so provide bird-safe, unsprayed flowering, fir, pine, willow or elder branches, wooden block or vegetable tanned leather toys, puzzle/foraging toys, ladders, swings and ropes. Also provide overhead misters or shallow water bowls for bathing. Declining in some areas (E Brazil) due to deforestation and some illegal trade. The Blue-headed Parrot will most likely lose up to 23% of suitable habitat within its range over 20 years based on a model of Amazonian deforestation. Its population will be expected to decline by <25% over three generations. P.m. menstruus: Trinidad, Guianas, and Venezuela to E Colombia, E Ecuador, and E Peru south to C Bolivia, and Amazonian Brazil. P.m. rubrigularis: S Costa Rica and Panama to W Colombia and W Ecuador. Found up to 1100m (3608 ft) in lowland tropical forest, including rainforest, deciduous and savanna; subtropical formations, cultivated areas, plantations, clearings with trees, secondary growth forest and seasonally in dry caatinga forest in Brazil. Feeds on various seeds, fruits and flowers. Forages in the upper canopy. 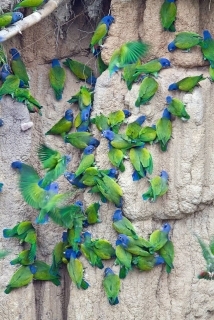 Social and boisterous while not breeding, gathering in large groups where food abundant or when roosting. Nests in old tree cavities previously used by other species. February-April, Panama; February-March, Colombia; February, Venezuela; March and October, Trinidad; February-May, Ecuador.